This is by far my favorite season here in Austin. We finally had some good rains this winter so the blue bonnets are back in force. The weekend weather looks beautiful and sunny, next week should be a bit rainy but our lakes need to catch up anyway. It very rarely snows here and is often overcast in the winter, the summer is so hot and the fall is not quite the stunner that I’m used to back home with the aspens. Spring is not too hot, everything is freshly green and bright and best of all are all the wildflowers everywhere. Busy weekend ahead, we are double booked in the evening tomorrow with the last hockey game and party and his first guitar recital. Sunday evening I have a class at Central Market, but I will write more about that tomorrow when I’m not quite so tired. I went shopping then made eggplant Parmesan for dinner, yum! 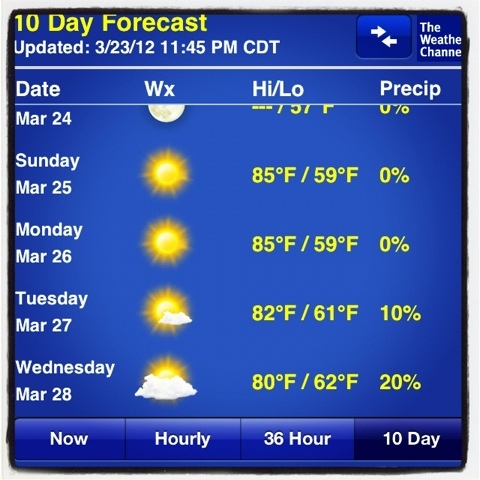 This entry was posted in Instagram, Project 366 and tagged Austin, Instagram, project 366, spring, Texas, weather. Bookmark the permalink.